Man, I need one of these t-shirts! 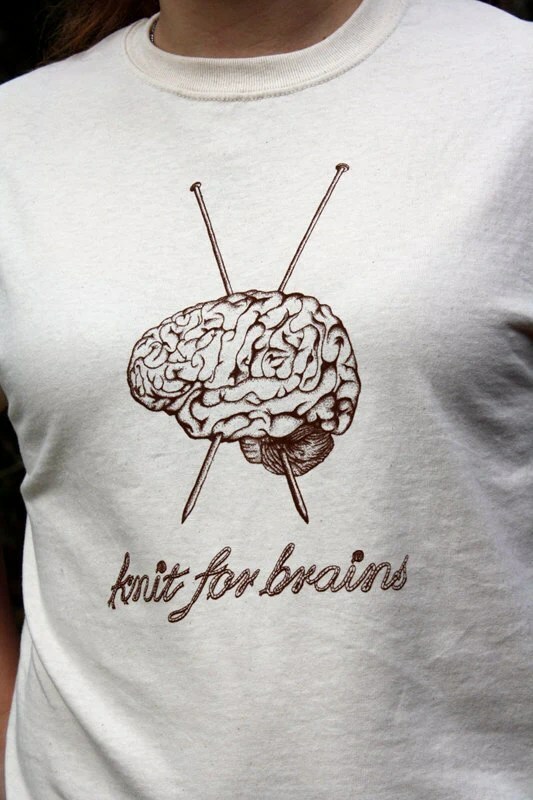 Check out this shirt and lots more cool stuff, over at DecorNoir on Etsy. And because I’ve still got a serious sweater jones (not to mention a sweater stash that’s quickly reaching critical mass), and because it’s just too hot to contemplate wool, I dug deep into the stash and pulled out some Debbie Bliss Cathay (sadly now discontinued), a cool cotton/rayon/silk blend, and worked up a quick swatch. As is often the case with me, there’s a story behind this yarn. It was the first sweater’s worth of yarn that I ever bought. I’d seen the Tahoe Cardigan in Knitty Spring 2007, right after I first took up knitting. It looked like something I’d wear, and it looked fairly straightforward for a new knitter, so I added it to my Ravelry queue. And then I went to my LYS during their semi-annual sale, and lo and behold, Cathay was on sale. I scooped up ten balls. I showed the pattern to a woman at the LYS, who didn’t read it very carefully, and steered me toward a 100% cotton worsted-weight yarn for the trim. I got home, read the pattern again, and realized that it was nowhere near right for the trim, so I ordered some yarn online. That yarn was comparable to the yarn used in the pattern, but I just wasn’t in love with it, so I set it aside for a bit, and knit a simple pullover with set-in sleeves. It fit me well, but I didn’t like the seams at the top of the sleeves, which simply felt too bulky in the worsted weight yarn I’d used for the sweater. So then I decided that a super-drapey yarn like Cathay should have a drapey, seamless construction. I’m still not sure what I’m going to do about the trim. I bought some silk hankies a while back that would make a neat contrast to the Cathay. I love the idea of using some special handspun yarn to finish it off. (I already have the perfect buttons, made from sea glass, which I found on Etsy, my go-to button source!) Failing that, though, I do have loads of sock yarn, so I am sure I could dig up something. But for now, I have a sweater’s worth of summer-weight yarn to knit with, so between Tahoe and finishing the toddler cardigan, I should be able to survive the next couple of months until cooler weather arrives and working with wool yarn becomes appealing again! To avoid grafting, I started at the top of the hood with Judy’s Magic Cast-On, flipped it over, worked across a purl row, and then used magic loop to continue the purl row across the opposite side. This made the top totally seamless, so hopefully it will be more comfy for a little newborn baby head. The pattern calls for a garter stitch edging and i-cord ties to close. I worked one selvedge stitch at either side and then picked up stitches at the end for 2×2 ribbed buttonband, worked on size 4 needles (to accommodate the difference in gauge, I picked up every stitch around the neckline). I found perfect buttons on Etsy, from Tessa Ann. I also worked the bottom in 2×2 ribbing on size 4 needles, increasing once every 7 stitches this time to accommodate the difference in gauge. As written, the pattern goes straight from the hood into the body. I was concerned that it would stretch out there and not fit properly (since babies tend to have rather rounded shoulders and not much in the way of necks), so I added a stabilizing neckband, which I adapted from a post on the Yarn Harlot’s blog as follows: I ended the hood after a knit row. Then I used a crochet hook to work a loose row of single crochet into the purl bumps of the previous row. Put last loop on the needle and started next knit row by k2tog this loop with the first stitch. The pattern is worked in a solid color, but I added some sporty little stripes. This was a gift for a co-worker of my husband. I am told that it was quite a hit! Also, I loved this yarn. It gets a bit fuzzy as you’re knitting, but it feels like cashmere, knits like wool, and is machine washable. Doesn’t feel like cotton yarn at all. I think I’ve found my go-to yarn for baby knitting! A freak storm rolled through our area late Friday night. Gusts up to 70mph brought down trees and branches all over the place. We were lucky not to sustain any damage to our house or vehicles, but it did knock out our power. We had previously planned to take a day trip to the beach with friends on Saturday, and we briefly considered canceling. And then we thought about spending one of the hottest days of the year in a house without air conditioning and with two bound-to-be-cranky kids. Um, beach it was! We had a fabulous day. We joined three other families with children in ages close to my kids, so the kids frolicked on the beach and the parents hung out and gabbed and were generally happy that we weren’t at home. The weather was extremely hot (near 100°F), but the water was refreshingly cool, and there was a steady breeze near the water. I’d grabbed my Pinkerton Shawl on my way out the door and managed to knit a few rows in the car and on the beach. It still doesn’t seem like I’m making much progress (except for the spot where I screwed up the garter stitch edge and once again had to drop about 10 rows to fix it, urg! ), but the short-row section appears to be getting a bit wider, so there is hope that I will finish it someday. We checked in throughout the day with other friends and neighbors, but by the time we’d planned to leave, it was clear that our house was not likely to have the power restored for at least another day. So we employed the magic of the smart phone and after several calls, were able to find a hotel with rooms still available for that night. (As the commercial goes: Hotel room… $200. Not having to listen to your kids complain all night… priceless!) On our way out the door that morning, we had packed a couple of overnight bags with pajamas, toiletries, and another change of clothes, just in case. One of our better decisions, I think! We got home late Sunday night, about an hour after the power came back on. Because we’d been away all weekend and hadn’t opened the fridge, our food hadn’t even spoiled. Our impromptu vacation turned out to be a great idea all around! The heat wave is continuing here, and there are still portions of our county who are projected to be without power until the weekend, so we’re doing what we can to help them out. I know a lot of folks are also without power in southern New Jersey, as a result of severe storms there, too. Plus I’ve got friends who are dodging wildfires out in Colorado. So wherever you are, I hope you’re safe and sound! !